Did you know that there are more than 1.8 trillion dollars worth of junk bonds outstanding in the United States alone? 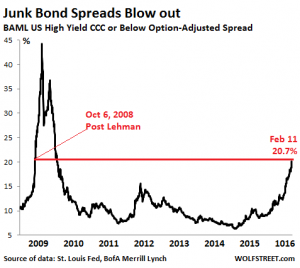 With interest rates at record lows all over the world in recent years, investors that were starving for a decent return poured hundreds of billions of dollars into high yield debt (also known as junk bonds). This created a giant bubble, but at first everything seemed to be going fine. Defaults were very low and most investors were seeing a nice return. But then the price of oil started crashing and the global economy began to slow down significantly. Energy company debt makes up somewhere between 15 and 20 percent of the junk bond market, and the credit rating downgrades for that sector are coming fast and furious. But it isn’t just the energy industry that is seeing a massive wave of defaults, debt restructurings and bankruptcy filings. Just like with subprime mortgages in 2008, investors are starting to wake up and realize that the paper that they are holding is not worth a whole lot. So now investors are rushing for the exits and we are starting to see panic on a level that we have not witnessed since the last financial crisis. During the last financial crisis, junk bonds starting crashing well before stocks did. In fact, many consider junk bonds to be a sort of “early warning system” for stocks. For many analysts, when you see high yield debt collapse that is a huge warning sign that you need to get out of stocks as soon as possible. And this makes perfect sense. When financial trouble erupts, it is going to hit more vulnerable companies first usually. Blue chip companies are typically not in the high yield debt market. Normally, high yield debt is only for companies that have more risk associated with them. And it is risky companies that typically start to crumble the quickest. What these charts are telling us is that a new financial crisis began during the second half of last year and that it is now accelerating. The average yield of CCC or lower-rated junk bonds hit the 20% mark a week ago. The last time yields had jumped to that level was on September 20, 2008, in the panic after the Lehman bankruptcy, as we pointed out. Today, that average yield is nearly 22%! At this cost of capital, companies can no longer borrow. Since they’re cash-flow negative, they’ll run out of liquidity sooner or later. When that happens, defaults jump, which blows out spreads even further, which is what happened during the Financial Crisis. The market seizes. Financial chaos ensues. After junk bonds crashed in 2008, virtually every other kind of investment followed suit. Just about the only thing that didn’t crash were precious metals. Gold and silver soared, and that is what you would expect to happen during a major financial crisis. 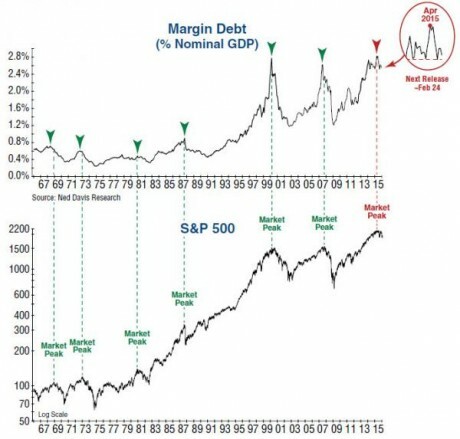 Another thing that I am watching closely is margin debt. During past financial bubbles, we have seen lots of people borrow lots and lots of money to buy stocks. If that sounds like a really bad idea, that is because it is a really bad idea. After looking at that chart, I can’t understand how anyone couldn’t see the pattern. We keep making the same mistakes, but we never seem to learn from history. In fact, the mainstream media keeps telling us that this new financial crisis “isn’t 2008″ over and over again. Even though the exact same patterns are happening once again, they still believe that this time will somehow be different. And to a certain extent that is actually true. This current crisis is not going to be the same as the last one. Eventually, it is going to prove to be even worse than the last one once everything is all said and done. So what should we all be doing? In a recent article entitled “70 Tips That Will Help You Survive What Is Going To Happen To America“, I gave my readers some basic pieces of advice on how to get prepared for what is coming. But not all of them will apply immediately. For example, my wife and I don’t believe that we will need our emergency food next month. But down the road we are absolutely convinced that we will need it. For the moment, one of the key things is to build up an emergency fund. In my opinion, everyone should have an emergency fund that can cover at least six months of bills and expenses. And now is not the time to go into debt. Instead of buying lots of shiny new toys, now is a time to spend money on practical things that will be needed during the hard times that are coming. Unfortunately, most people believe what they want to believe, and most people do not want to believe that hard times are coming. They have an extraordinary amount of faith in the system, and they are convinced that this time will be different somehow. So I wish them the best, but as for me and my family, we are getting prepared.